I met my friend Kai at the corner of St Mark's Place and something. This neighborhood in the East Village use to be a lot edgier – the domain of punks and the down and out. But that was then, and now there are just a few shops and people left to reflect that old image. When Chipotle Grill moves in, you know the times they are a changing. 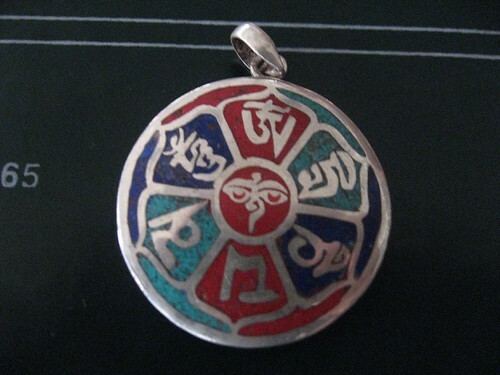 Before he had arrived, I ducked into a Tibetan shop and browsed the silver pendants with various Buddhist designs in turquoise, lapiz, and coral. In Nepal I paid $12-15 for one, and wore it upon arrival in India, but either the necklace broke while I was walking to my hotel with the backpack on, or it was stolen when it fell off my neck once I was shown to my room. Either way, I was upset to have lost it so quickly. I bought another in Darjeeling for about the same price, and at some point mailed it home, but with all my souvenirs unwrapped, it is nowhere to be found. In NYC, the exact same pendants were going for $50. We got dinner in one of the many Japanese restaurants that lined St Mark's. We sat at a counter facing the kitchen. 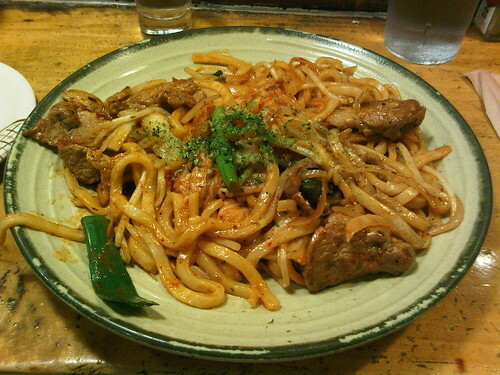 I ordered spicy noodles with pork and cabbage. While we were waiting for food, we began to share a bottle of sake. Despite being a rather cheap one, it still tasted smoother than the few other sakes I've consumed in my life. The noodle meal was delicious, and Kai assured me that the atmosphere and setup of the restaurant was very similar to what you find in Japan. After dinner, we caught a taxi to Broadway East bar which was in the shadow of the Brooklyn Bridge. Kai said he'd been there before with my brother as part of a wrap party for a movie featuring McCauley Caulkin. The Home Alone child star was there too. The layout of the bar/restaurant was weird, so I won't try to explain it, but eventually we met up with Kai's friend Ray and his friend whose birthday it was, and some of his girl friends. We hung out for awhile on the lower level bar, which had a DJ. It was a small space, but we seemed to be entertaining ourselves. Since returning home, I'd been anxiously awaiting the time when it'd be right to enjoy my favorite top shelf liquors. I may have splurged on gourmet food from time to time on my trip, but I never ordered a Grey Goose and tonic. Delicious. Sometime in the early morning, we left the bar and took a cab to the Meatpacking District on the west side, but I was a bit out of it by then. Kai, of course, knew where to go. I can only recall cobblestones and lots of women dressed up nicely. We went into one bar and walked out with two mini hamburgers. Normally, I'd think they wouldn't be good if they're so small, but these burgers were a good call at that time of night.